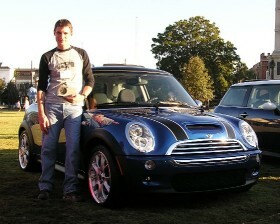 MINI Life in Charleston: First-Annual South Georgia MINI Outing this weekend! First-Annual South Georgia MINI Outing this weekend! Tonight we venture to Savannah for what will hopefully turn into an annual event. The First (hopefully annual) South Georgia MINI Outing starts tonight around 6:00PM, where will depart from the La Quinta Inn for Tybee Island and the North Beach Grill. I hear this place is great, and from looking at the menu it sounds tasty! and possibly the Hofwyl-Broadfield Plantation. The trip should be a blast for all. For more detailed info, check-out Murray Wilson’s site here. If you want to go, just show-up! Hope to see you all there! Thank you Matt. Hopefully we will have these events more often than annually. If we get a good turnout, we will certainly plan some more motoring events and you won't have to wait a year!